During the summer abundance of eggplant, squash, and tomatoes we’re often in the OMG-what-can-I-do-with-these-zucchini mode. 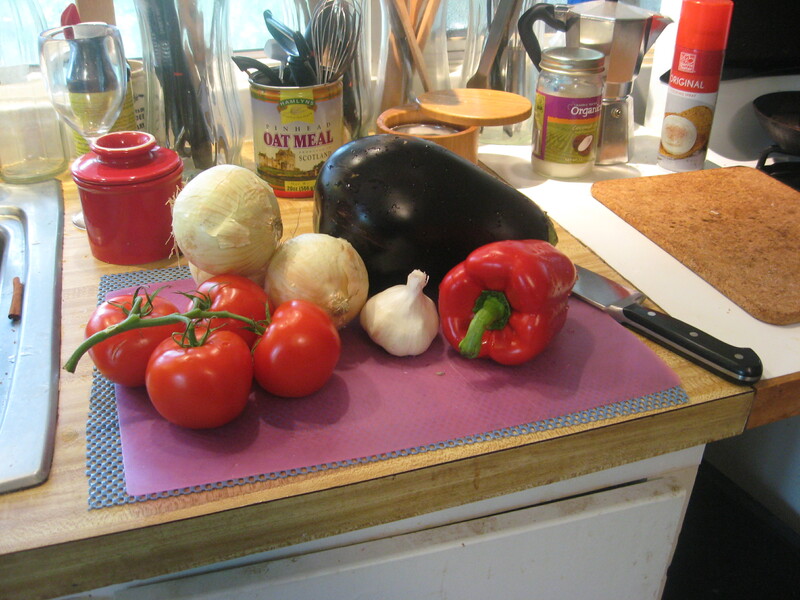 Ratatouille and caponata provide some good eating even when the hot weather has rather killed the appetite. I thought that being able to do this in the slow-cooker instead of stove-top would be an advantage in sweltering weather that is already taxing the A/C without adding more heat. 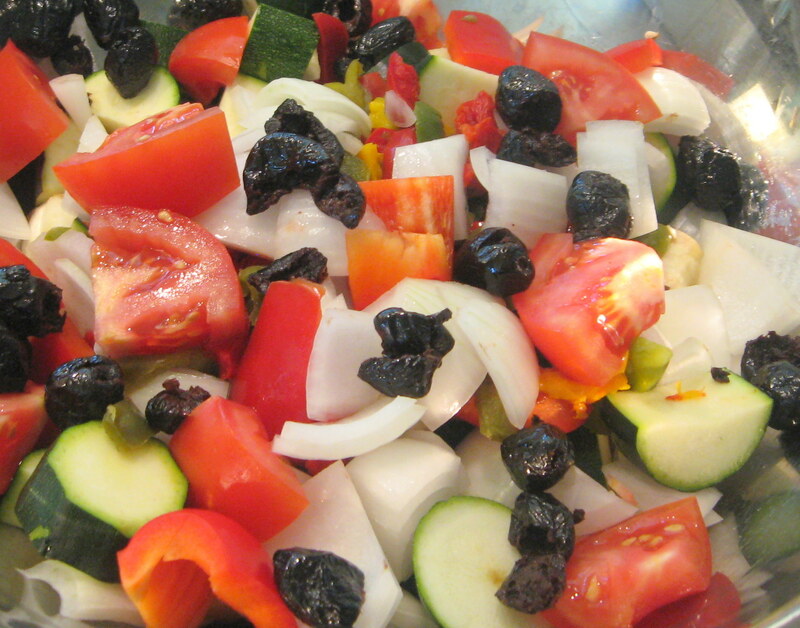 It’s easy to find ratatouille recipes–a quick search on the internet will provide a plethora. The question: are they “good” recipes”? I’m not sure I can tell you what (specifically) tells me “good”, “passable”, or “oh yuk”. Most likely past experience, and reading a lot of food science, and (from America’s Test Kitchen) “why this recipe works”. 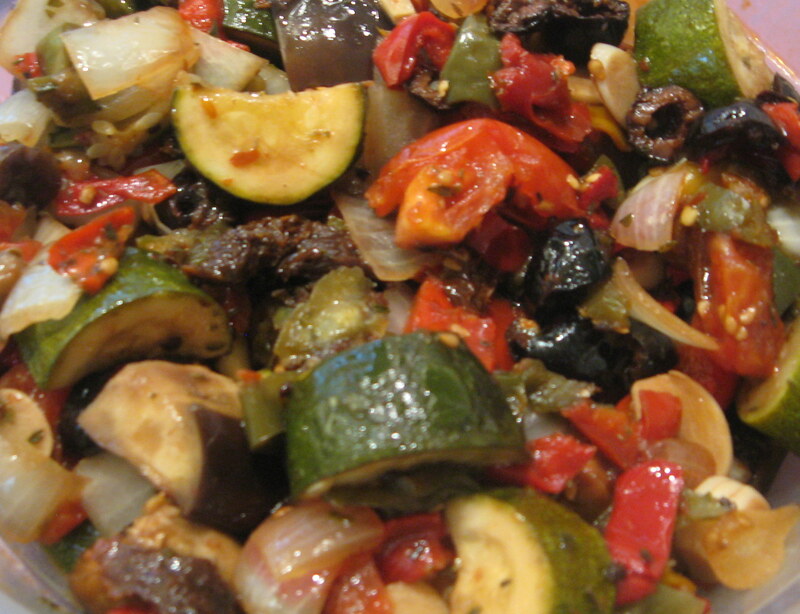 Here is a ratatouille recipe given by a friend, from Food.com, reproduced below. I’ve never made ratatouille in a slow cooker so I thought this was worth trying. In reading the recipe, I had only a couple questions, so I decided to make the recipe as directed–well, almost–as much as I can–I’m just a compulsive tinkerer, and constitutionally unable to follow a recipe strictly, but almost. Looking at the recipe, I knew I’d want more garlic. Had I not been using part frozen peppers (from a Kitchen Disaster), I would not use green peppers–I prefer ripe (red, yellow, or orange) like them. I’m changing the herbs to thyme and oregano, rather than basil (for reasons explained below in Cook’s notes). My other question about this recipe had to do with that quantity of tomato paste. Why? When I started the prep, I was still undecided about the tomato paste. My inclination was to leave it out because this is an “all fresh” dish, and (to me) tomato paste tastes canned and cooked. Since this does not call for the tomato paste to be added until later, my obvious solution is to wait and see how it tastes, especially since these are summer tomatoes. If I were wanting to supplement the “tomato” part of the flavor I would likely add some sun-dried tomatoes, rather than tomato paste–unless there is a dearth of “umami” (which is one of my reservations about slow-cooker dishes). The modifications that I made on this recipe on the first round are shown in parentheses after the ingredient. These were just to meet my seasoning preferences, not for any other reason. Don’t hold this on “warm”–it just doesn’t do well. Sprinkle the eggplant with salt; let stand in a colander 1/2- 1 hour to drain. Rinse the eggplant with water and pat dry with paper towels. Place the eggplant in crock pot. Add onions, tomatoes, bell peppers, zucchini, olive oil, basil, garlic, pepper and 1/2 tsp salt. Cover and cook on high setting about 3 hours or until the vegetables are tender but still hold their shape. Stir in the tomato paste, olives, and the fresh basil. Serve hot, room temperature or chilled. Notes: Being of scientific orientation, I decided to do an experiment–half the recipe is cooked as above; and the other half cooked separately, with modifications after I had tasted the results of the original method. First, I had to cook for an additional hour–I thought my rice cooker/slow cooker ran rather hot, but not according to this. After tasting I did add the tomato paste as the tomato flavor was not at all pronounced, but I think the tomato paste (unless browned before adding) doesn’t add the depth I want. I needed more salt (which kind of surprised me because I don’t usually need to add much. Oregano and thyme needed to be bumped up as did the garlic. Those minor things were done to the first batch. So far the onions have stayed crispy and I think I’d prefer them a bit softer so maybe microwave them before putting into the slow cooker (that had to wait because they were already mixed with the other vegetables). This came out with more juice than I’d expected. Now for the second batch. I’m adding more olives, more garlic (sliced rather than pressed), some red pepper flakes (about 1/8 teaspoon) for a little zing (but not a lot of heat), and sun-dried tomatoes (instead of tomato paste), a bay leaf, and increasing the oregano and thyme. Instead of increasing salt, I’m going to add just a touch of nam pla (fish sauce)–or an anchovy fillet mashed would work. This is not intended to make it at all fishy just more flavorful. This needs to be stirred after an hour so that the bottom veggies don’t mush and the top be a bit undercooked. Check for doneness–don’t just trust the time. I prefer my veggies cooked but with a little “tooth” to them, so in my slow cooker this finishes in about 2 hours. I like this one as there’s no added liquid, except the dash of nam pla and what the veggies give off. Minced fresh oregano added the last 15 minutes of cooking leaves it very fresh tasting. Bottom line: this is quick and works if you want a very light ratatouille, not complex ratatouille. I don’t want my ratatouille over whelmed with herbs and garlic, but I’d like to make it a bit more complex, or layered flavor–maybe it needs a little more umami It has the advantage of being very quick to assemble. As you likely know if you’ve read other posts, I’m somewhat partial to recipes from America’s Test Kitchen. When the published Slow Cooker Revolution I had to check it out. I was hoping that those recipes would improve my attitude to (and increase use of ) my slow cooker. There’s no denying it’s convenience, but generally I’ve simply not been happy with the results when compared with oven or stove-top methods. A comparison of America’s Test Kitchen recipe with the one above is interesting. One of my “complaints” is that their recipes sometimes seem more complicated–though they do increase flavor. The recipe below is from the Slow Cooker Revolution (Kindle edition). This is the recipe that inspired me to try the one above. The cooking instructions are quite extensive so I’m only going to summarize them for purposes of comparison. I’m trying to find a compromise of best flavor and easy preparation. Brown eggplant, half at a time, in olive oil (5 to 7 minutes), and transfer each batch to slow cooker. Brown zucchini, half at a time, in olive oil, transferring each batch to slow cooker. Cook onions, bell peppers, garlic, and thyme until softened and lightly browned (8 to 10 minutes), stir in flour and cook for 1 minute. Whisk in reserved tomato juice, scrape up browned bits, and smooth out lumps, and transfer to slow cooker. Stir tomatoes into slow cooker, close and cook until vegetables are tender (4 to 6 hours). Notes: The time it takes to brown the vegetables really is not that long, so it’s worth the extra flavor. It’s a drastic difference, even when you add some umami-hyping ingredients to the Food.com recipe. The differences here are, notably, the use of flour to thicken, the lack of tomato paste, and the preparation of the eggplant. One of my reasons for trying the recipe from Food.com is the handling of the eggplant, with the idea that salting to remove fluid might eliminate the need for flour–I doubt that you’d know there was flour in this recipe simply by tasting. After tasting the first batch of the recipe from Food.com with the adjustments noted in Notes, it’s a keeper for simplicity. The America’s Test Kitchen is a bit richer since you’ve browned the veggies. Either is good–depends on the time and effort you want (or have) to invest.